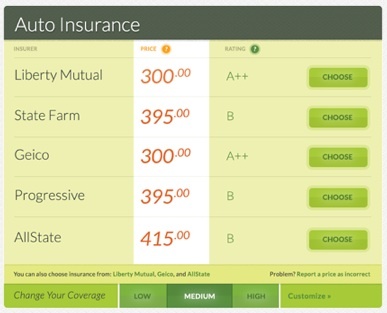 Leaky, a Y Combinator-incubated startup that helps customers compare the price they’d pay with car insurance companies, is expanding to full nationwide coverage today. The startup first launched more than a year ago, but the site quickly attracted attention (as well as cease-and-desist letters) from insurance companies, so it was taken down and reemerged in March with a new approach. Rather than pulling prices directly from insurers’ websites, Leaky looks at their state regulatory filings, then predicts what each user would be charged based on their personal details. Leaky can also predict how changes in your life, such as moving across the country or buying a new car, will affect your insurance costs. Co-founder and CEO Jason Traff said that until now, Leaky was only available in California, so this is a big expansion. The site has also grown from supporting seven insurers to more than 100. Traff added that the monitoring feature, which was released after the March relaunch, has been a hit. The company is also announcing that it has raised $675,000 in seed funding from YC, 500 Startups, Start Fund, Box Group, and several angel investors. Future plans include providing these sorts of features for other types of insurance.